I’m hoping that y’all had a great Thanksgiving. What I am most thankful for above all else are my loved ones. I’m also grateful that Cassandra at Food is My Friend has nominated me for a Liester Blog Award! Thanks Cass, I’m so glad that you considered me! We’ve been following each other for a few months. Her blog has terrific recipes and beautiful pictures to go with. When you stop by her site, be sure to check out her adorable bunny at Flatpac Fridays. 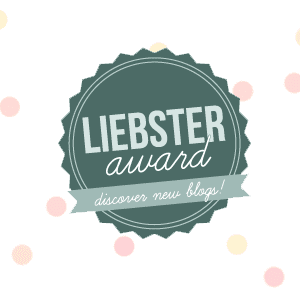 Have you heard of the Liebster Blog Award? Liebster is a German word meaning dearest. The Liebster Award is given to up and coming bloggers with fewer than 200 followers. It is meant to recognize and encourage new bloggers. 4. Nominate 11 bloggers and mention them in your post. 5. Go and tell the person who nominated you, along with the people you’ve nominated about your post. 1. I love the Lord! I had lived for most of my life without Jesus. Life with Jesus is a million, billion, gazillion times better! 2. I have only ever been in love with one boy/man. My husband (Billy) and I started dating when we were teens; we were babies really! 3. I am the oldest child. I have a sister who is 16 months younger than me, and a brother who is 4 years younger. 4. I have moved over 20 times throughout my childhood and adulthood. I feel as though two places are my home however; South Florida where I now reside, and Victoria B.C. where I was born and most of my family lives. 5. I went to culinary school, where to me the most important thing that I learned were knife skills. I like having all fingers intact. I don’t think that one needs culinary school to be a good cook. I think good cooking comes from instinct and PRACTICE. 6. I am hoping for the Fanny Pack to come back into fashion so that I can get rid of my way too heavy handbags. 7. I don’t have kids, but I do have three cats who are my babies. 8. My very favorite food is cheese. The snack drawer in my refrigerator is always jam packed with cheese, and we eat every bit of it. If I were to ever become lactose intolerant, I would be very, very, very sad. 9. I like to eat vegetarian, but Billy has GOT to have meat, so I often cook both a vegetarian and a meat version of a dish. 10. I think very practically, but can also be very silly. 11. My favorite albums are Abba’s Greatest Hits, Anne Murray’s Greatest Hits, Carole King’s Tapestry, Dr. Hook’s Greatest Hits, Ultimate Broadway, anything Disco and anything George Strait. 1. If you were stuck on a desert island, what food would you request? -I can’t pick one food, but I can pick one meal. For me it’s always cheese, bread, olives and chocolate! 2. Dark, milk or white chocolate? 3. Would you rather cuddle or eat a bunny? 4. What is your ‘go to’ quick dinner recipe? -If I want to eat in 10 minutes, it’s an omelet; if I can wait for 30 minutes, then pasta with tomatoes and basil. 5. Are you a team player or a lone ranger? -Both. I try to see my friends at least once a week, but I also crave alone time. 6. Where are you travelling to next? -We live a long way from family, so our vacations are always to see them. My family is in Victoria B.C., Canada, and Billy’s family is in Bigfork Montana. 7. What are you doing for Christmas? -I can’t think that far ahead! 8. Have you ever won anything? -I won Lacrosse tickets on a radio contest, which I never used. 9. What is your ideal night out? -I love to hang out at a friend’s home for dinner and games. 10. If you won $1,000,000, what would you do? -Pay off the loan on my house, give some to family members, take a trip that is not to see family, and give some to my favorite organizations (see below). 11. What is your favourite charity? -I am on the auxiliary for His Caring Place, a faith based crisis pregnancy program; and Billy and I are involved with 4KIDS if South Florida, a foster care program. 1. Who has been your biggest influence in the kitchen? 2. Who has influenced you most in life? 3. What dish or food says “comfort food” to you? 4. If you could travel to anywhere, where would it be? 5. What’s your favorite season and why? 6. Are you crafty / handy? 7. What tool (kitchen, make up, auto, etc.) can you not live without? 8. What’s your all-time favorite book? 9. What’s you all-time favorite movie? 10. Would you rather watch sunrise or sunset? 11. What do you like to do on a night out? Be sure to check these blogs out for yourself. I can't wait to learn more about each one of them! Thanks for stopping by Posed Perfection and for leaving me a sweet comment about the Burlap Bird Ornaments. They were a ton of fun to make. Thanks also for the sweet nomination of the Liebster Award. I am honored that you would consider me. I hope you have a wonderful week!